(Newser) – It's hard to have a healthy diet when you often eat at fast food joints, according to sensible dietary advice posted in an unlikely place: McDonald's own employee resources website. 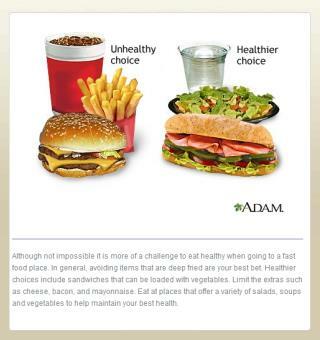 "Fast foods are typically high in calories, fat, saturated fat, sugar, and salt and may put people at risk for becoming overweight," warns the website, which labels a picture of a cheeseburger, fries, and soda "the unhealthy choice" and a picture of a sub, salad, and cup of water the "healthier choice," CNBC reports. And workers with a hankering for Big Macs may want to hold out hope that there's no mayo in the "Special Sauce": The site recommends one "limit the extras such as cheese, bacon, and mayonnaise." It feels like a prostitute is giving me advise on abstinence. if you have to "work" there you should get all the free food you can get!